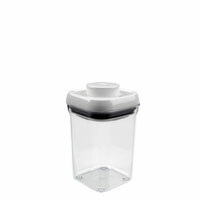 he OXO Good Grips POP Containers are airtight, stackable and space-efficient, making it easy to keep your dry foods fresh and your kitchen organized. The Containers have a unique push-button mechanism that creates an airtight seal with just one touch. The button also serves as a handle to lift off the lid. The Containers are designed for modular stacking so that you can efficiently organize your countertop and pantry. In addition, with their square and rectangular shapes, the POP Containers make the most of any storage space, while their corners allow for easy pouring. The POP Containers are available in 11 different sizes to meet your dry food storage needs. They are also great for use in the garage, sewing room, play room and more; in fact, the Containers can be used in so many places that you�ll want them POPping up everywhere. The lid comes apart for thorough cleaning.